Sprains and Strains – What are they & what is the best treatment? Soft tissue injuries (STI) are when trauma or overuse occurs to muscles, tendons or ligaments. Most soft tissue injuries are the result of a sudden unexpected or uncontrolled movement like stepping awkwardly off a curb and rolling over your ankle. These are injuries our Physiotherapists see every day at our Edinburgh physiotherapy and sports injury clinics. However, soft tissue damage can also occur from excessive overuse or chronically fatigued structures, especially muscles and tendons. For example, if you were to do a long run when already fatigued (from a previous run or exercise), then it is possible to cause trauma or a strain to key running musculoskeletal structures like your calf muscles or achilles tendons, also see: “How to prevent running injuries”. What are the most common soft tissue injuries? Tendons are fibrous bands that attach muscles to bone. Trauma to muscles or tendons due to overstretching is referred to as a ‘strain’. Ligaments are also fibrous bands that hold bones together. Trauma by over-stretching of ligaments is referred to as a ‘sprain’. Strains and sprains are both very common and can occur from accidents during sport, at home or at work. What are the symptoms of soft tissue injuries? When soft tissue is damaged, there is usually immediate pain along with immediate or delayed swelling (excessive swelling can slow the healing process – see treatment below). Stiffness is also very common as a result of the trauma and swelling. Bruising may also develop after 24-48 hours. In the case of moderate to severe soft tissue injuries of muscles, tendons and ligaments around a joint, there may be instability experienced, especially to weight-bearing joints like the hip, knee and ankle. How long will it take to recover from a soft tissue injury? The recovery time from grade 1 soft tissue injuries in one to two weeks and three to four weeks for a grade 2. Grade three soft tissue injuries require immediate assessment and treatment, with much longer recovery times. Recovery times can also depend on your age, general health and occupation. If you are not sure of the nature or extent of your injury, contact an experienced Specialist Physiotherapist for advice. Should I go to a hospital with a soft tissue injury? Stage one: During the first 24-72 hours, it is important to protect the injured area, gain an accurate diagnosis and follow the PRICE regime (see below). If possible, gentle pain free movement should be encouraged. Stage two: Reduce swelling and stiffness and begin to regain normal movement. Stage three: Regaining of normal function and return to normal activities. Minimise using the affected area the area and initially avoid stretching which could further weaken the damaged tissue. If trauma is severe, protect the injury from further damage. Stop any activity that will aggravate the injury. Use of crutches to take the weight off an injured knee, hip or ankle injury may be necessary. A sling may help to protect an arm or shoulder. Rest and avoid activities that cause significant pain (for example walking, raising your arm). Allow sufficient rehab time for even small injuries. Choose alternative. Wrap ice cubes in a damp tea towel, use frozen peas or a sports ice pack. Use the ice pack for 15–20 minutes every three to four hours when awake. Very cold products can induce hypothermia or cold burns so wrapping the ice in a cloth is advisable. Apply a firm bandage that does not restrict circulation or cause additional pain. The bandage should cover the whole joint. Raise the limb above the level of your heart, if possible in order to help reduce the swelling. Support the limb with cushions or a sling to keep it raised when not walking or using the limb. Pain relief may also be required. If you are not sure what medication to use, your Specialist Physiotherapist, Pharmacist or GP can advise you. What to avoid when you have a soft tissue injury? Increases blood flow and swelling. Increases blood flow and swelling, and will slow up the healing process. Promotes blood flow and can increase swelling and can, therefore, increase damage if begun too early. An experienced Physiotherapist can assess your injury, and confirm both the diagnosis and extent of damage. They will provide you with advice, hands-on treatment and exercises which will promote a prompt and effective recovery, as well as reduce the risk of further injury in the future. (see also “how to avoid running injuries”) Your Specialist Physiotherapist will also advise you on a progressive return to normal activities and alternative exercises to follow whilst you are injured. What Exercises are there for Soft Tissue Injuries? There are so many different types of soft tissue injuries it would be impossible to list the exercises for all of them in this article. Here is an example of an exercise routine after an ankle injury. The program begins with the easiest exercise progressing the hardest as your ankle gets stronger. 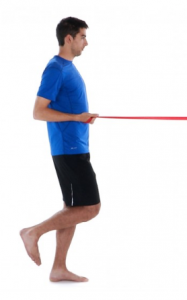 Tie a length of resistance elastic in front of you at waist level and hold the elastic tightly in one hand. Lift one leg up (elastic side) and pull the elastic towards you as far as possible, by bringing your shoulder blades together and moving your arm back. Maintain your balance on one leg with your shoulders back and your trunk stable during the exercise. Slowly return to the initial position and repeat. Begin with 1 set of 4-6 reps or less depending on how the ankle feels. Progressively build up to 3 sets of 8 reps. 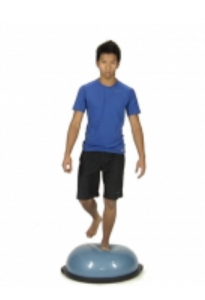 Stand up with the injured leg on the rounded part of a Bosu (you can begin with balancing on both legs, to begin with, if the ankle is too sore). Move the opposite leg in a half circle motion to challenge your balance. Maintain a balanced and upright posture throughout the exercise. Begin with 3-5 x 10-second balances and progressively built to 3 x 30 seconds. With your knee at hip width and arms overhead, take a step forward and bend your knee and hip to 90 degrees. Keep your torso and your hip stable and the foot aligned with the knee and the hip. Return in control to the starting position and repeat. Begin with 1 set of 3-5 reps and progressively build up the 3 sets of 6. Sit in a chair with a physio resistance band tied around your foot and against a stable object.Begin with an easy resistance and progressively increase when your ankle feels ready. Keep your knee still and your heel in contact with the floor while you move the sole of your foot towards the outside. Return slowly and repeat. Begin with 1 set of 4-6 reps and progressively increase this to 3 sets of 8 as the ankle allows.